I just received the newest release (September 16, 2016), Porcupine Meat, from Bobby Rush and it's a mover. 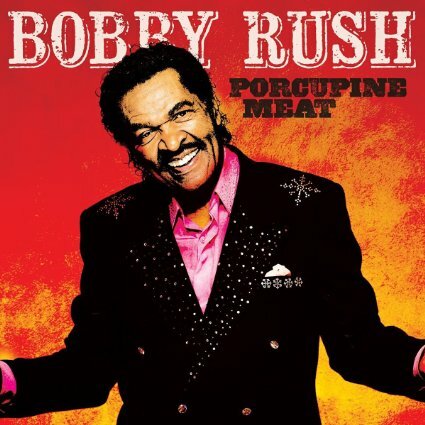 Opening with I Don't Want Nobody Hanging Around, Bobby Rush has a high steppin funky opener featuring a cooking horn section, great bass lines and of course some fine harp work. With a smooth R&B feel, title track, Porcupine Meat, is a real cruiser with Vasti Jackson laying down some tight riffs on guitar over a solid bass line. Very cool. Slow blues number, Got Me Accused, really gives Rush the opportunity to show his deep blues roots. With his soulful vocals and crying harp playing, this track is heavy. Again the strong bass lines really anchor the track and salted lightly with guitar, this track is smokin. R&B track, Snake In The Grass, has strong radio play sound with a catchy hook and a solid beat. Funky track, Funk o' de Funk, has really super bass line and the funk is so deep you can smell it. Punched up horns, keyboard and nicely placed harp work. This track hits the groove. Me, Myself and I is a smooth, jazzy number with a rock solid bottom and clean guitar riffs added by Joe Bonamassa. Catfish Stew is a cool pop jam with a rolling bass line. Light hearted feel and cool horn work make this track sail. It's Your Move has a nice BB King like feel that almost glides across the airwaves. Dave Alvin lays in some really nice guitar work over a solid bottom and a strong keyboard cloud. Keb' Mo' slips on the slide hitting Nighttime Gardener running over a blues riff. Rush does his thing lyrically, and with no pause. A sure crowd pleaser. R&B track, I Think Your Dress Is Too Short, has a real nice feel. With it's super cool bass line, snappy drums and horn punctuation, Rush just rides the wave. Very nice! Standing On Shaky Ground is pure soul and the horns sound like they are pure from the 70's. Rush has seen it all and knows the way with billowy keys and clean accents. Cool track. Wrapping the release is I'm Tired, a high water stepper with nice harp work, slide guitar and light percussion. Rush's harp work is instinctual and gives this track a cool modern feel. Nice closer.